Despite Dr. Robert L. Lindsey's workload as the full-time pastor of a Baptist congregation in Jerusalem, Israel, Lindsey wrote eleven books and booklets (including his monumental, three-volume A Comparative Greek Concordance of the Synoptic Gospels) and thirty-one articles. Despite Dr. Robert L. Lindsey’s workload as the full-time pastor of a Baptist congregation in Jerusalem, Israel, Lindsey wrote eleven books and booklets (including his monumental, three-volume A Comparative Greek Concordance of the Synoptic Gospels) and thirty-one articles. These constitute a surprisingly large body of work, considering Lindsey’s pastoral responsibilities. 1. Israel in Christendom: The Problem of Jewish Identity. Jerusalem: no publisher, no date (between 1954 and 1959). 369 pp. 2. A Hebrew Translation of the Gospel of Mark. Jerusalem: Dugith Publishers, 1969 (1st ed. ); 1973 (2nd ed.). xxvi + 162 pp. (Preface to the 2nd ed., pp. v-xxvi. Foreword by David Flusser, pp. 1-8. Introduction, pp. 9-84. Greek text and Hebrew trans., pp. 85-159.) Updated and corrected versions of Flusser’s foreword and Lindsey’s introduction were published in electronic format in 2014. 3. A New Approach to the Synoptic Gospels. Jerusalem: Dugith Publishers, 1971. 23 pp. 4. The Gospels. Jerusalem: Dugith Publishers, 1972. 18 pp. 5. From Luke to Mark to Matthew: Notes on the Sources of Mark’s “Pick-ups” and the Use by All the Synoptists of a Central Noncanonical Source. Jerusalem: Dugith Publishers, 1982. 55 pp. An updated and corrected version of this article entitled From Luke to Mark to Matthew: A Discussion of the Sources of Markan “Pick-ups” and the Use of a Basic Non-canonical Source by All the Synoptists was published in electronic format in 2014. 8. A Comparative Greek Concordance of the Synoptic Gospels. Editor. 3 vols. Jerusalem: Dugith Publishers, 1985, 1988, 1989. Vol. 1: xvi + 451 pp. (Preface by Elmar Camillo dos Santos, p. iii. Introduction by Lindsey, pp. v-xiv.) Vol. 2: 327 pp. Vol. 3: 300 pp. (Elmar Camillo dos Santos compiled and collated Vols. 1 and 2. James Leonard Burnham assisted with the editing of Vol. 2, and compiled and collated Vol. 3.) The introduction to A Comparative Greek Concordance of the Synoptic Gospels was updated and corrected and published in electronic format under the title “Measuring the Disparity Between Matthew, Mark and Luke” in 2013. 9. The Expansion of His Kingdom: New Insights Into Isaiah 9:6-7. Tulsa, OK: HaKesher, 1989. 20 pp. 10. Jesus Rabbi & Lord: The Hebrew Story of Jesus Behind Our Gospels. Oak Creek, WI: Cornerstone Publishing, 1990. 227 pp. 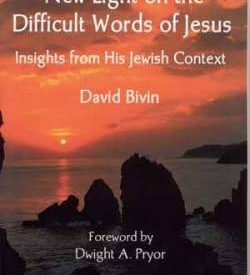 A second edition of the book, with emendations and updates by David Bivin and Linda Pattillo, was published in electronic format in 2009 under the title Jesus, Rabbi and Lord: A Lifetime’s Search for the Meaning of Jesus’ Words. 230 pp. 11. The Jesus Sources: Understanding the Gospels. Tulsa, OK: HaKesher, 1990. 111 pp. 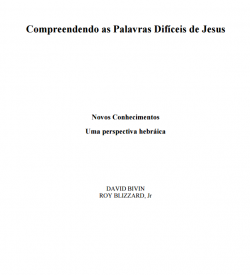 A second edition of the book, with emendations and updates by David Bivin, Joseph Frankovic and Ken Mullican, was published in electronic format in 2012 under the title The Jesus Sources: Uncovering the Literary Sources Used by Matthew, Mark and Luke. 86 pp. 1. “The Calling of the People of God According to the New Testament.” Hayahad Digest 3.13 (Mar./Apr. 1963), 3. 2. “Jewish-Christian Identity.” Hayahad Digest 3.15 (Jul./Aug. 1963), 1-2, 7-8. 4. “Luke, Our Oldest Gospel?” Hayahad Digest 3.17 (Nov./Dec. 1963), 2, 7. 5. “Problems of Biblical Translation.” Hayahad Digest 4.8 (May/Jun. 1965), 4-5. 6. “A Greater than Solomon is Here.” Hayahad Digest 5.1 (Jan./Feb. 1968), 2, 7. 8. “Some Significant Titles of Jesus.” Published in three parts in Hayahad Digest. Part One: 6.1 (Jan.-Mar. 1971), 2, 4, 6. Part Two: 6.2 (Apr.-Jun. 1971), 2, 4. Part Three: 6.3 (Jul.-Sept. 1971), 2, 4, 8. 9. “A New Approach to the Synoptic Gospels.” Christian News from Israel 22.2 (1971), 56-63. (Republished as a booklet by Dugith Publishers. See above, “Books and Booklets,” no. 3.) An updated and corrected version of “A New Approach to the Synoptic Gospels” was published in electronic format in 2014. 10. “Dialogue and Mission.” Published in three parts in Hayahad Digest. Part One: 6.6 (Apr.-Jun. 1972), 2, 7-8. Part Two: 6.7 (Jul.-Sept. 1972), 2, 6-7. Part Three: 6.8 (Oct.-Dec. 1972), 2, 6-7. 11. “Jesus in the Jewish Encyclopaedia.” Jerusalem Post (Aug. 18, 1972). 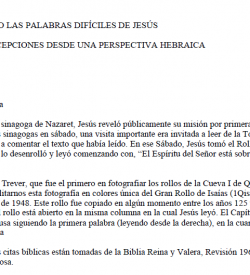 (A review of David Flusser’s entry “Jesus” in Encyclopaedia Judaica [Jerusalem: Keter Publishing House, 1972], 10:10-14.) 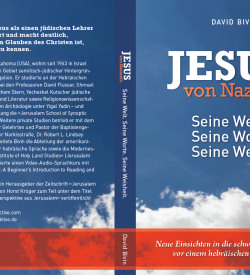 Reprinted as “A Review of David Flusser’s Jesus.” Dugith Publishers, Jerusalem, 1973. 13. “‘Verily’ or ‘Amen’—What Did Jesus Say?” Christian News from Israel 25.3 (1975), 144-148. An updated and corrected version of “‘Verily’ or ‘Amen’—What Did Jesus Say?” was published in electronic format in 2013. 14. “The Messiah in Biblical Prophecy and Christian Belief.” Hayahad Digest 7.20 (Jul.-Sept. 1977), 2-8. 15. “The Holy Spirit and Jesus’ Early Movement.” Jerusalem: Dugith Publishers, 1980. 9 pp. 16. “A Baptist View of Israel.” Hayahad (Mar. 1982), 4-13. 17. “The Nerve That Unlocks Power.” Fulness (Sept./Oct. 1986), 18-19. 18. “An Hebraic Perspective on Jesus’ Messianic Claims.” Through Their Eyes 1.2 (Nov. 1986), 1, 11. 19. “Jesus’ Messianic Claims: His Baptism.” Through Their Eyes 2.1 (Jan. 1987), 1, 18. 20. “Jesus’ Messianic Consciousness: The Temptation.” Through Their Eyes 2.2 (Apr. 1987), 1, 18. 21. “Sources for the Gospels.” Jerusalem Perspective 16 (Jan. 1989), 1-2. 22. “Early Gospel Texts.” Jerusalem Perspective 17 (Feb. 1989), 1, 4. 23. “How the Gospel Writers Worked.” Jerusalem Perspective 18 (Mar. 1989), 1-2. 24. “The Synoptic Problem: Laying the Groundwork.” Jerusalem Perspective 19 (Apr. 1989), 1-2. 25. “The Synoptic Problem: Gospel Similarities.” Jerusalem Perspective 20 (May 1989), 1, 4. 26. “The Markan Cross-Factor.” Jerusalem Perspective 22 (Sept./Oct. 1989), 10-11. 27. “The Kingdom of God: God’s Power Among Believers.” Jerusalem Perspective 24 (Jan./Feb. 1990), 6-8. 28. “Jesus’ Three Dispensations.” Yavo Digest 1.6 (no date, c. 1993), 12, 17-18. 29. “Jesus’ Twin Parables.” Jerusalem Perspective 41 (Nov./Dec. 1993), 3-6, 12. 30. “Unlocking the Synoptic Problem: Four Keys for Better Understanding Jesus.” Jerusalem Perspective 49 (Oct.-Dec. 1995), 10-17, 38. 31. “Paraphrastic Gospels.” Jerusalem Perspective 51 (Apr./Jun. 1996), 10-15. 32. “My Search for the Synoptic Problem’s Solution (1959-1969)” a previously unreleased article written in preparation for the press conference that took place in October 1969 upon the publication of his A Hebrew Translation of the Gospel of Mark. 33. “The Hebrew Life of Jesus” excerpted from the “Preface to the Second Edition” of A Hebrew Translation of The Gospel of Mark with corrections. Regarding footnote #2, I’ve seen this article referenced in Marvin Wilson’s book Our Father Abraham on page 21 and I’m trying to find this publication. Do you know where I can get ahold of this resource?